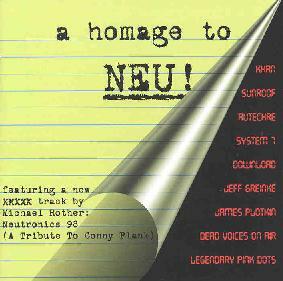 Various Artists - "A Homage to Neu!" Half of the releases in the Cleopatra/Hypnotic catalog are seemingly credited to 'Various Artists,' so it's no wonder that they petitioned a tribute album to that duo of Deutsche wunderkind better known as Neu!. The word 'neu' (pronounced 'noi') means 'new,' but of course their first three classic albums are over 20 years old now. However, this tribute album shows how far ahead of their time Klaus Dinger and Michael Rother were in 1972, as the 10 remakes of this tribute hardly sound any more modern than the originals, except on the surface. The music of Neu! was proto-industrial, proto-trance, proto-punk, proto-ambient, proto-you name it, and Cleopatra has found present-day artists in most of these genres to demonstrate all of these innovations in their own separate ways. Germany's Khan enters in with 'Fur Immer' from the second album, and ushers in the techno side of things, which continues with 'Hero' (by Sunroof) and 'Interstate' (by System 7). 'Hero' features some very pleasant female vocals and demonstrates how easy it is to extrapolate Neu! 's works to modern trance music. Using a sample from 'Hallo Gallo' once again, Steve Hillage came up with a new take on the Neu! theme with 'Interstate,' one of the strongest tracks presented. Here we get doses of both echoed staccato guitar and some guitar-synth 'whale sounds' from Hillage, nice additions to the layered synths and sampled rhythm. The next two tracks (both from "Neu! 2") explore the industrial/noise aspect of Neu!. Legendary Pink Dots offer 'Super,' with heavy fuzz guitar and 'agonized' vocals; perhaps a bit more chaotic than Neu! themselves. 'Lila Engel' by James Plotkin (of the band Solarus) features a choppy electronic beat, and is high on experimentation with a heavy dose of backmasking (a Neu! trademark). The 70-minute tribute finishes off with the excellent ambient piece 'Im Gluck' by Jeff Greinke (of Land, from the Hearts of Space family). Greinke covers the droning low-end base with a cosmic sea of delayed synth tones, and thereby brings about a gradual conclusion to the album. As a Neu! fan, this is a nice item to have in my collection, but Cleopatra would be doing the band and all of us a bigger favor if they'd produce official CD reissues of their original three albums. Hopefully, this is in the works. In the meantime, Rother and Dinger are still active as solo artists, the former in a current partnership with longtime partner Dieter Moebius (Cluster/Harmonia), and the latter in la! Neu?. So the music of Neu! lives on in several ways.